Monica Brown is the award-winning author of Pablo Neruda: Poet of the People (Henry Holt), which won the Américas Award for Children’s Literature and an Orbis Pictus Honor for Outstanding Nonfiction, Waiting for the Biblioburro (Random House), a Christopher Award winner, and many other celebrated books for children. 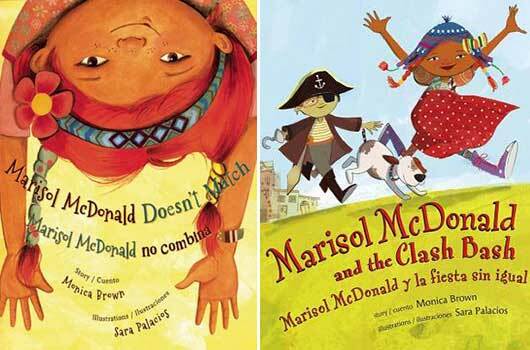 Her picture book, Marisol McDonald Doesn’t Match/Marisol McDonald no combina (Lee & Low) received the Tejas Star Book Award, the International Latino Book Award, and a Pura Belpré Honor for Illustration. Marisol McDonald and the Clash Bash/Marisol McDonald y la fiesta sin igual, the second book in the bilingual Marisol McDonald series, releases this month, in time for Hispanic Heritage Month. Brown’s books are inspired by her Peruvian-American heritage and desire to share Latino/a stories with children. The Marisol series is one that the author feels particularly close to. Here, Brown shares the inspiration behind these very personal books, and her thoughts on celebrating what makes each one of us unique. Mamiverse: What inspired you to write the “Marisol McDonald” books? MB: I was inspired by my own experiences—my life and that of my siblings, my cousins, and my own children. There really were no picture books that reflected the multiplicity and richness of our experiences as biracial, bicultural children. I grew up in a beautiful world of travel between the United States and Peru, of family that was Catholic and Jewish, and with people I loved spread over several continents. My mother called us “citizens of the world,” and we truly felt it. I wanted to share that idea with young people and also celebrate the nonconformists of the world. I can tell you, however, that there was also a specifically negative experience that acted as a catalyst for this manuscript. A cousin brought a new girlfriend to a family wedding. I guess she’d never seen such a big, diverse, multicultural family, because she made several really inappropriate comments. Observing us all, she confided in me, saying, “I see that lots of the light cousins married dark ones, and the dark cousins married light ones.” With my Swedish and Norwegian husband, I was one of the “dark ones” who married “light.” As you can imagine, I don’t think of my husband and myself, or our beautiful daughters in terms of “dark and light,” but I reflected on just how commonplace categories like that are. When my husband took out our dark-haired daughter Isabella alone, folks would sometimes ask him if his wife was “foreign,” and when she was born; the nurses in the maternity ward told us that they had nicknamed her “our little Eskimo.” This led me to think about how we in the United States think about race, and how we represent those who are different from our perceived norms. I began to think about how to tell the story of a little girl who is unique and sweet and who defies any attempts to limit her expression of self . . . and that is how Marisol McDonald was born! Mamiverse: How has your family reacted to the Marisol McDonald series? Do they see themselves in the book? MB: Absolutely! My extended family is always supportive, and I even named the characters after my nieces and nephews. Two of my sobrinos have red hair, and several of my cousins are Peruvian and Scottish as well. What’s been most gratifying, however, is how many complete strangers have come to me at book festivals and conferences, eager to express their own kinship with Marisol! She has made an impact on multicultural families across the United States. Mamiverse: How did you decide to make the books in this particular series bilingual? MB: In an ideal world, all books would be bilingual! In many families, it opens ups the storytelling experience to multiple generations. I am the daughter of a bilingual Latina whose first language was Spanish. I am a bilingual Latina whose first language is English, and my daughters are still learning Spanish. I want my work to reach as many minds and hearts as possible, without barriers. I’m thrilled to say that my work has been translated into Portuguese, Japanese, Greek, and, of course Spanish! As you know, I think translation is an art best left up to those with a deep and nuanced understanding of both languages, be they Spanish, English, Vietnamese, or French. I’ve loved working with you on my books, Adriana, because you capture the creativity and spirit of the work in your translations. Mamiverse: Do you think that there is a need for more children’s books that depict multicultural/multiethnic families? MB: Absolutely. I was shocked at how difficult it was to find a publisher for Marisol McDonald so many years ago, and I’m still surprised at the dearth of children’s literature depicting the multi-racial, multi-lingual experience of multicultural families like mine (and yours!). We need to think beyond boxes and labels, because so many of us never fit in just one in the first place! We need to think in terms of inclusivity and respect, rather than easy stereotypes. Perhaps it is the border-dwellers, those that straddle multiple cultures and communities, who can help us celebrate the connectedness of us all. Mamiverse: Do you have any advice for our mamis on how to raise bicultural/biracial children? MB: I think we need to raise our children to be proud of their multi-ethnic heritage, and to explore the multiplicity of their own being. One part of that is surrounding them with children’s books and art and music that acknowledges and celebrates the many facets of our heritage! Another part is valuing all parts of their heritage. For example, my daughters have spent a great deal of time in North Dakota and Minnesota during the summers, where my Scandinavian/Euro-American husband grew up. They’ve also been to Peru to meet their many cousins and relatives there. My children were seven and nine when we visited South America with my mother and she had the joy of sharing the Peru of her childhood with her granddaughters. Just last fall, I had the pleasure of bringing my older daughter Isabella with me when I represented the United States at the Arequipa International Book Festival in Peru. I was traveling with the U.S. Embassy doing teacher trainings, readings, and school visits, and it was truly a gift to have my then-14-year-old by my side. In fact, she turned 15 in the Jorge Chávez International Airport in Lima at midnight, just before we left! So my Tía Sussy, Isabella (named after my mother Isabel Maria) and I celebrated her quinceanera in style with some lúcuma ice cream. Mamiverse: Can we expect more Marisol McDonald books in the future? MB: Yes, I certainly hope so! I’ll tell you a secret: I’ve recently finished a third Marisol McDonald manuscript, but I haven’t yet submitted it to my wonderful editor Louise May at Lee and Low, so that’s all I will share for now. At the moment, I’m focusing on launching Marisol McDonald and the Clash Bash/Marisol McDonald y la fiesta sin igual. I hope it does well and merits yet another Marisol adventure! Mamiverse: Are you working on another book? If so, can you tell us a little about it? MB: I’m very excited about the two books I have coming out in 2014: Maya’s Blanket/La manta de Maya (Lee and Low) and Conoce a Pablo Picasso (Santillana USA). I’m also hard at work on my first chapter books series for young readers, featuring another beautifully multicultural girl who is strong, unique, funny and fierce. 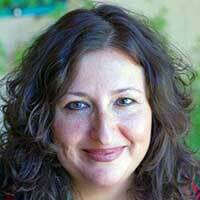 Adriana Dominguez is the Book Reviews Editor of Mamiverse. You may follow her @vocesblog, or visit her website: adrianadominguez.com.